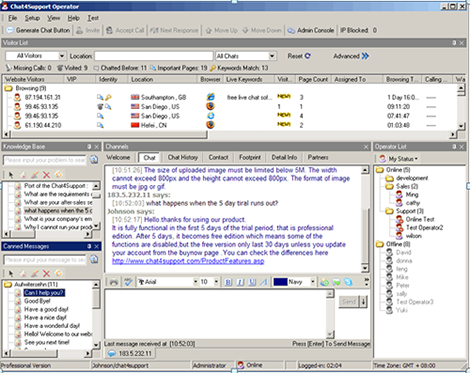 Chat4support is a free program for website live chat,which is a software for you to live chat on website,track visitor's footprint and increase sales revenue.As you look for live chat program for your on-line business, you want one that will allow you to customize the program to your needs and grow with your company. 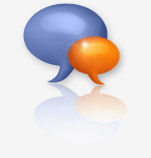 Live chat services need to fit the needs to two groups: your support team and your customers. The following criteria will help you determine which software works best for you and your visitors.Try Chat4support,that is the best solution! When a visitor comes to your website,they may have desire to know more about your products.You have designed your website to represent your company and your brand. That design should carry through the entire site, including your live chat box.Your live chat box may represent your company logo ,product image ,webpage popularity,etc.When visitors want to know more about the product information,they will call you by the live chat box.This time,you can get closer to the visitors and give instant live chat and live help to them.They may get more interest of your product that they will be one of your customers after live chat.This time,as an operator ,you should be active ,Chat4support lets you pro-active chat with visitors.Pro-active chat with customers may switch visitors into potential customers. You need to choose a live chat application that offers the features you need to successfully communicate with your customers. It's that easy. If you are running a small business, you don't need a laundry list of features to connect with your customers. We do suggest that you choose an software that with features that both operators and customers will benefit from, such as sound and visual alerts for incoming messages, a built-in spell checker and a typing indicator. Chat4support has a highlight feature that lets operators to realize when there is a visitor call them.With this function,they will avoid missing calls and improve the service satisfaction . With a powerful live chat tool, you can collect a lot of information about your online visitors, including the website that referred them to your site, their click-through path and the browser they use. You can also see how many times the visitor has been on your website before, and if so, you can review heir past purchase and chat history. All of this information helps you to see what areas of your site get the most attention and where visitors may decide to leave. Not everyone is an HTML/PHP/CSS professor who is able to whip up a customized code in minutes and place it on your site. As the owner of a small or medium-sized business, perhaps you don't have experience using coding software. If this description fits your situation, have no fear because the majority of the live chat support applications we reviewed are simple to use and require no coding experience. Chat4support is easy to download ,easy to install and easy to integrate.For Several steps ,live chat for website can be achieve. Block IPs of some vicious visitors. When you block one visitor successfully, the number of vicious visitors who are blocked will be added and displayed in the tool bar. 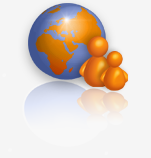 Provide multi-language options for your visitors, so you can meet the needs of your visitors around the world. You can capture any screens and transfer them to whom you are chatting with.With this feature,it is a more easy way to convey messages which can not be explained by words. Upload images of chat buttons or create your own design, and use them for both online and offline buttons. Once you integrate such a live chat software for website,you can communicate with your visitors and customers.By online customer chats and free php cutomer support online live help, you offer free customer service live support and open source live help customer chat to your visitors. You can suppose that whether customers or visitors are willing to wait for a long time for your responses about their requests or not. By using Chat4support, your operators can do everything efficiently due to the use of chat with your customers or visitors. Chat4support offers multiple features that will increase your sales revenue.How?When your operators are chatting with customers or visitors ,they will be more interested to your company,so that would like to spend more time on chatting.At this moment,you can catch the opporturnity to satisfy the visitors and give the most useful live help to them.They may feel at ease that will purchase the product.As time goes by,more and more people will realize your website and your products,more and more people will visit your website,then you will earn more and more moeny . With Chat4support,you just need to pay little cost.Most online selling had spend much money on phone-call and advertisement,but they did not receive the expected result.However,Chat4support can help you decrease the cost.Without picking up the phone,you can contact with your visitors and customers easily.You can also save the money on promotion,that Chat4support live chat program can be a good messager that can convey positive image to the audience. Try Chat4support and you will feel surprise to the result !